I’m old enough to have started writing on a typewriter – albeit, as a kid. I couldn’t imagine going back to one now, but there is something rather lovely about the sound and rhythm of the keys. For creative writing, I actually use an app that creates simulated typewriter sounds, simply because I find that puts me in the right mindset. 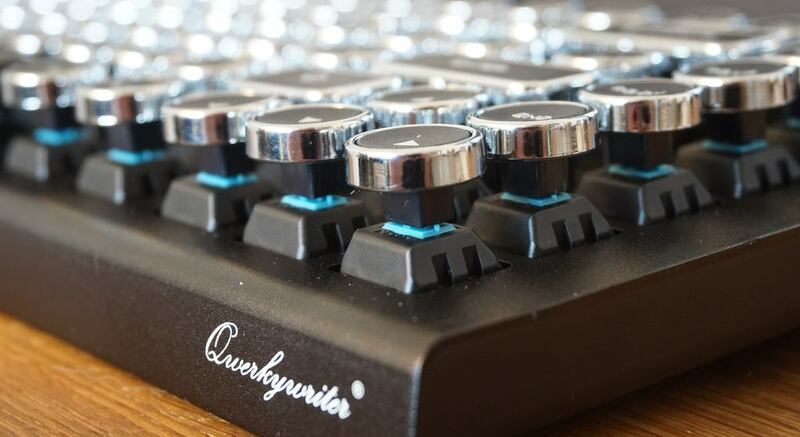 So when I spotted the Qwerkywriter on Kickstarter ages ago, I always meant to check it out. A recent post on 9to5Toys reminded me about it. From photos, I loved the look. My questions were whether it would look as good in real-life as it does in the photos, whether it would turn out to be a novelty or a serious keyboard – and whether it could possibly justify that $349 price-tag? Let’s start with the looks. At a casual glance, you really could mistake it for a compact typewriter. In fact, I’m pretty sure if you asked anyone who wasn’t familiar with it what it was, that’s what they’d say. It has those lovely round keycaps with the chrome edging, the carriage-return bar, the paper-feed wheels, the lovely red tab and delete keys, and that proper three-dimensional look of a typewriter keyboard. On closer examination, it gets a little less impressive. The chrome key surrounds are plastic, not metal, as are the keycaps themselves. And the paper-advance wheels don’t turn. I mean, there’s of course no reason for them to – they are purely decorative – but I did expect them to, just for fun. Close-up, then, it looks a little cheaper than it did in the photos. But it’s still undeniably a lovely-looking thing. There’s a deep slot at the back designed to hold a tablet. It’s a multi-platform device that will accommodate just about any tablet on the market, and with my 9.7-inch iPad Pro slotted into place it really does a most convincing imitation of a typewriter. The iPad is held securely in place when it’s used on a desk or table. But I found that after using it for a while, the typewriter illusion had become so convincing that I simply picked it up by the base to move it and almost dropped the iPad in the process! It’s of course not attached in any way, merely resting in the slot. 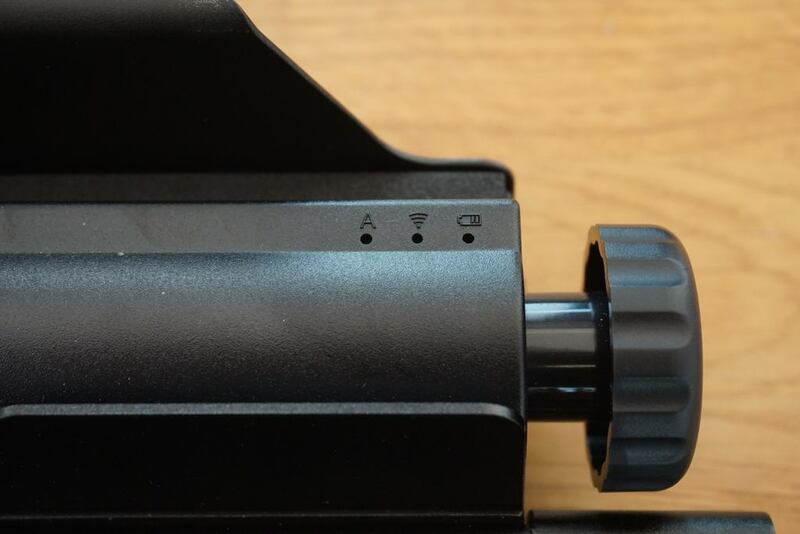 I mentioned that the Qwerkywriter is not specific to iDevices, and that does pose a few issues. For example, the CMD and Option keys are the wrong way around, while the Fn key is in completely the wrong place. The upper function keys, too, aren’t properly mapped. For example, F1 and F2 control the volume rather than the brightness of a Mac. Qwerkywriter tells me it has a firmware upgrade that fix the volume and brightness keys, but not the others. One other minor issue with the usability of the keyboard – which the photo doesn’t capture – is that the Escape key is slightly awkward to reach because the carriage-return bar gets in the way a little. Oh yes, the return bar. This is one element that isn’t purely decorative: it does actually function as an Enter key! That’s definitely a fun touch, though I confess that I used it a few times and then just used the normal Enter key after that. You can also program it as a macro key, but with only five characters, it’s of limited use for that. But enough of the aesthetics: what’s it actually like to type on? It’s here that the price starts to feel a little more reasonable. 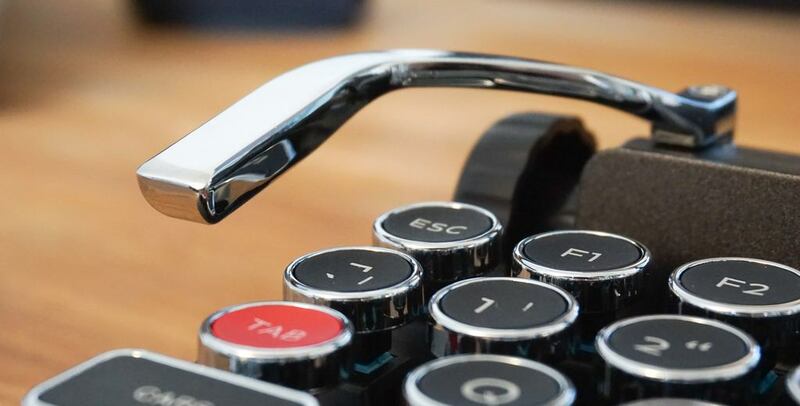 The Qwerkywriter isn’t just a visual novelty, it is a proper mechanical keyboard. It has a very similar feel to a keyboard that uses Cherry switches, but the company tells me they couldn’t obtain these in sufficient quantities, so they instead used Kailh ones. Cherry keys are German while Kailh are a Chinese copy, which of course immediately raises quality questions. In use, however, it felt to me extremely similar to keyboards I’ve used with Cherry switches. The travel is good, the feel is positive, and they have that lovely sound (Qwerkywriter has a recording here). The only question, then, is whether the Kailh switches would have the longevity of the real thing, and that’s not something I can tell from a short review. The misplaced CMD and Option keys was a real usability barrier when using it with a Mac. I wasn’t so bothered by the numbered function keys as I rarely use them, but those two keys were a pain. However, if someone wanted to use the keyboard full-time with a Mac, there are ways of remapping the keys, so this is not necessarily a dealbreaker. However, my bottom-line view after using it for most of a day is that, as a Mac keyboard, it’s hard to justify the money. It’s cute and all, but the typewriter illusion is less convincing when looking at a monitor, and there are far cheaper keyboards available with Cherry switches. As an iPad keyboard, the typewriter illusion is much stronger. It definitely feels fun, and it is a very nice keyboard to use. However, I rarely type on my iPad when I’m at home. In the home, my iPad is a tablet – used mostly as an ebook reader and Netflix device. It’s on-the-move where it becomes a pseudo-laptop, used for writing, email, messaging and so on. And that’s really where the argument for the Qwerkywriter started to look a little dubious for me personally. It’s a pretty heavy and chunky thing to carry around with you. So, much as I love it as a concept, and it mostly lived up to my expectations, I don’t think it’s actually for me. However, that’s not to say it’s not for everyone. If you love it enough to want to use it full-time, then the one-time effort to remap the keys would be worthwhile. 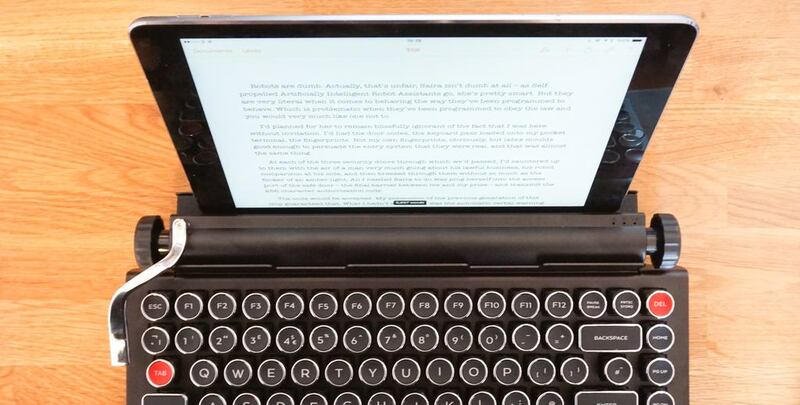 If you love typewriters but type a lot on your iPad at home, it really is the best of both worlds – giving you a convincing illusion with none of the hassles of the real thing. At $349, it’s a pretty expensive toy, but I can definitely see that some would consider it worthwhile. The Qwerkywriter is $349 direct from the company’s own website. There are, of course, a huge number of Bluetooth keyboards available on Amazon – including ones with Cherry switches. Check out, too, the SteelSeries Apex M800 mechanical keyboard Jeff recently reviewed.